Please note that bus sites are not supervised before pick-up or after drop-off times. Children not picked up within 5 minutes of the scheduled drop-off time by an adult will be brought back to your designated YMCA. Moose Route: Elk River YMCA, Turtle/Squirrel Routes: Emma B. Howe YMCA. Regularly Scheduled Routes for all weeks EXCEPT 4th of July week, and the last two weeks of camp. *All times are subject to change a little. 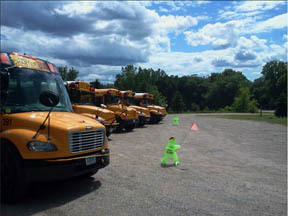 Please check back the week before your camper’s session for accurate bus stop times.